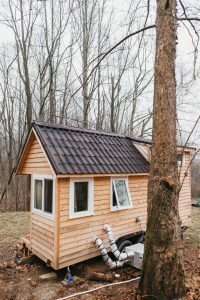 Tom Belliveau, a math teacher, and his wife, Lindsay Anne, built a DIY tiny house named Teela about a year ago and lived in it for nine months. Now they hope to sell it. 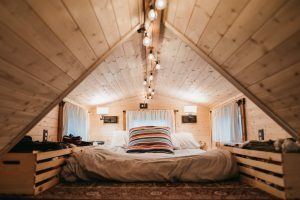 The couple’s decision to vacate their tiny house and buy a more conventional home illustrates one of the fundamental problems confronting the tiny house movement – buying land for parking is difficult for myriad reasons. 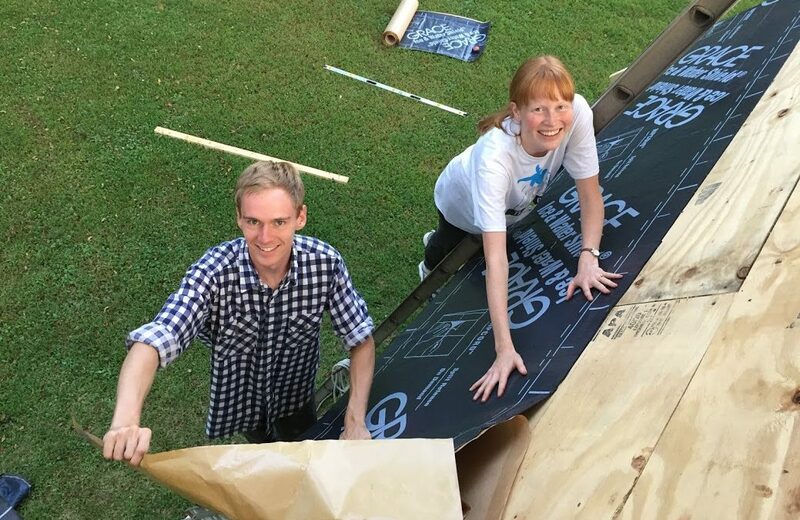 In central Maryland, where Belliveau lives, land is expensive, and it’s often difficult to borrow money to buy land when the buyer has no intention of improving it with a permanent (fixed-foundation) dwelling. “People ask how it has been for our marriage. We moved in only a few months after our wedding. It was good for us as a couple I think. No huge knock-down, drag-out fights,” said Belliveau. “We enjoyed the simplicity of sitting in the woods. The isolation feeling was good, especially when we went to bed. It was easy to relax. Meditative moments. An enjoyable setting. It’s easier to be present than the typical American lifestyle mostly because all your stuff is stored away. It was enjoyable to just be together,” said Belliveau. “But, in some ways living in a tiny house complicated our lives, too. We were more worried about the house. We had two cats and we didn’t have quite enough room. Lindsay Anne is a professional photographer and we didn’t have enough space for her business equipment. It was hard,” said Belliveau. “There was a day in April or May when the winds blew 60-70 MPH. All the trees were swaying, and big branches were coming down. It was a little unsettling. We decided to leave and go to my dad’s for a while,” recalled Belliveau. “Still, we’re glad we did it. I think I learned four times as much as I did in college at a fraction of the price. 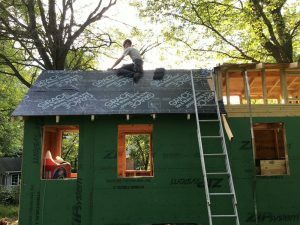 We went into it with zero knowledge and we were forced to learn about all the stuff that goes into a house,” said Belliveau. “I think tiny house living is easier for a single person than a couple, but it’s definitely doable,” said Belliveau. It took a year-and-a-half to build the tiny house, according to Belliveau. “It’s a Tumbleweed Cypress model. My dad, who is a home inspector, helped us a lot, especially with the harder stuff. Building with my dad was great. Bonding time with him. It was a shared activity. Sometimes you don’t know what to talk about, but because we were working together every day we had a lot of time to talk about other things. It was great,” said Belliveau. 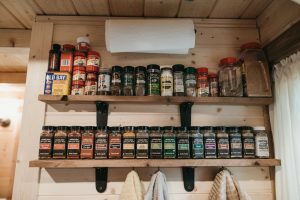 The 20-foot house has a storage loft above the door, a bed loft, galley kitchen and table and bench. 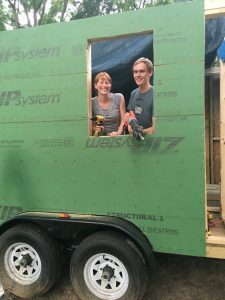 “For water we tapped into our landlord’s water line before it got to their water heater, dug a 50-foot trench with a backhoe, and buried a well line-type pipe out to the tiny house. We buried the electrical cable in same trench. Where the pipe came up out of the ground, we installed a spigot and connected between the spigot and tiny house with hose. We used electric heat tape to keep it from freezing, and there were a few nights when we just left the water dripping to prevent a freeze. It never froze,” said Belliveau. “We had a Nature’s Head composting toilet, and we dumped our grey water into a PVC French drain that drained down hill from our house and into the woods,” said Belliveau.